President Donald Trump urged supporters not to lose faith with his administration on tariffs on Tuesday, criticizing the news coverage of his efforts to fight for fair trade policies. 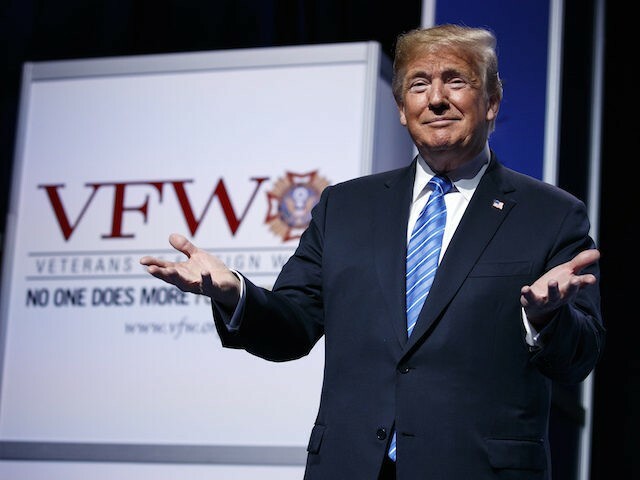 “Folks, stick with us, stick with us,” Trump said during a speech during the VFW convention in St. Louis, Missouri. Trump appeared frustrated by the news coverage of his attempts to get a better deal with foreign countries on trade, blaming it on lobbyists. The audience cheered Trump and booed the news media in response. Trump blasted an NBC news report that featured critics of his trade fight. He argued the current economic climate was a good time to enact tariffs.